Will we run out of effective antibiotics? This is perhaps one of the most worrying questions of this age, and I think the problem of antibiotic resistance is sometimes overlooked and underestimated. In this post I will be gathering my thoughts on this huge issue and reflecting on just how great a crisis this could be for modern medicine. First and foremost, I think placing this issue in context will help us all to appreciate the severity and immensity of the issue. It is a known fact that antibiotics are majorly over used and also incorrectly used. Britain’s chief medical officer, Sally Davies, described antimicrobial resistance as posing a “catastrophic threat” and it has also been placed within the top 10 most devastating effects on public health. A failure to address the problem could result in 10 million deaths by 2050 costing £66 trillion! This suggests that in just over 30 years antimicrobial resistence will kill more people than cancer! This is deeply worrying! This just shows that the problem of antibiotic resistance isn’t as small and ignorable as some of us may have perhaps thought it to be. When we are not feeling very well we may go and pay a visit to the GP. At this stage we will be naturally worried, unsure of what the diagnosis could possibly be. However, once the diagnosis of an ‘infection’ comes through we tend to breathe a sigh of relief, it’s only an infection, I’ll be as right as rain just after a course of antibiotics. This has almost become routine to the world, a course of antibiotics will clear away any the infection and you’ll be fine and dandy once again. Imagine not being able to do that. Imagine being back in the 1940s where the risk of a woman dying after childbirth was 50 times greater due to a lack of antibiotics. Developing resistance to antibiotics is essentially like not having these treatments at all, it will give us a huge kick back on the road to progressing in the field of Medicine. Variation occurs within all species so some bacteria have genes that code for proteins that will give it an advantageous feature of being able to resist the action of the antibiotics. This doesn’t seem too much to worry about, surely a single bacterial cell being resistant to penicillin cannot cause too much trouble, right? Wrong! Bacteria multiply and replicate at an incredible rate. This one resistant bacteria will become 2 resistant bacteria in just 20 minutes, another 20 minutes later, we will have 4 resistant bacteria, then 8, then 16, then 32 and so on and so forth. They multiply at an exponential rate! That means that from having 1 resistant bacteria, at the end of the day this will become 47,223,664,830 (that’s forty-seven billion, two hundred and twenty-three million, six hundred and sixty-four thousand, eight hundred and thirty resistant bacteria now!) If this doesn’t sound like an army of resistance yet, what if I told you bacteria can easily slide their resistant genes to other non-resistant bacteria, instantaneously doubling the number of bacteria that become resistant from this single gene? And then if you think about this resistant gene being vertically transmitted to 5, 6, 7, 100 bacteria, who can all pass it on further and replicate exponentially…the whole issue seems to blow out of proportion. The number of resistant bacteria floating around now becomes uncountable, unthinkable. Now, think if you were to become infected with one of these cells…your infection would potentially be incurable. Scary! This is Fleming’s own warning about the catastrophe we seem to have found ourselves in today! The graph below is an interesting and rather shocking view of just how quickly bacteria have developed resistance to different groups of antibiotics. There is barely any time difference between the date of discovery and the date of resistance for some of these antibiotic classes. So now we must ask ourselves, why is this? Why are bacteria evolving resistance to antibiotics so quickly? Why is resistance developing faster than the rate at we can produce new antibiotics? What’s causing a rapid increase in resistance? The quick, short and simple answer to all these questions comes down to the cold hard truth that we are using just too many! I was shocked to learn that in the UK, 45% of all antibiotics produced are used in farming. This is because factory farmed animals are kept in confined and crowded conditions so infectious diseases spread quickly. Overuse of antibiotics will inevitably cause us to run out. We must find alternatives rather than simply resorting to antibiotics. Surely, increasing the space and living areas of farm animals would drastically reduce the need to use such a significant amount of antibiotics. We also cannot deny that over prescribing is a huge problem. Doctors sometimes feel pressured to prescribe antibiotics even though they don’t believe it to be necessary. Some patients do not understand that antibiotics are not the cure for all ills. 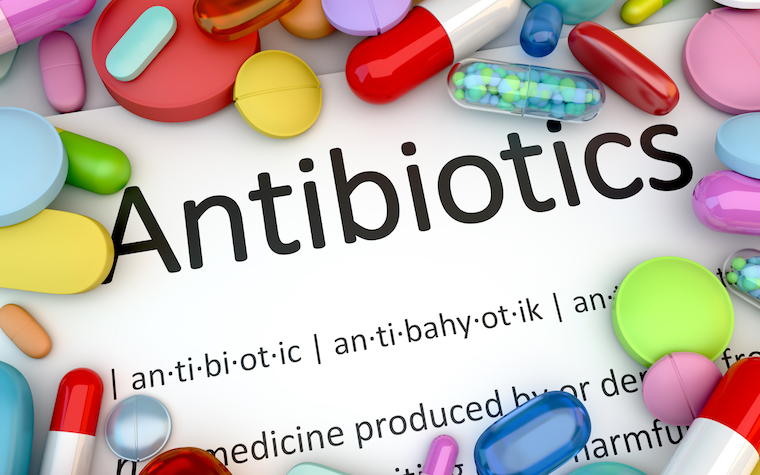 Antibiotics can only treat bacterial infections. No matter how unwell you are, taking a course of antibiotics for a viral issue will not in any way ease your symptoms, this includes sore throats, coughs, colds, flu and ear infections. In fact, demanding and expecting antibiotics all the time will only further deteriorate this global issue! What exactly is it that you can do? 90% of GPs have felt under pressure to prescribe a patient antibiotics. 44% of GPs have admitted to prescribing antibiotics to get a patient to leave the surgery. I suppose these statistics give our first answer…we must stop expecting to be prescribed antibiotics when we visit the GP. If your infection is bacterial and the doctor thinks antibiotics will benefit you, by all means you are welcome to take your course. But I think the first step is to raise public awareness about the fact that antibiotics cannot indeed treat everything! Did you know something as simple as washing your hands can stop the transmission of MRSA? The number of MRSA related deaths decreased from 1,593 in 2008 to just 25 in 2014 in Wales just by implementing this simple procedure. We have to go back to the basics, and if each and every single one of us did something as simple as that, the results will go a long way to stop spreading these resistant microbes. And of course, we have the famous, yet incredibly vital need for us to finish a course of antibiotics that we are given. I’m sure many of you would have heard this several times, but just to emphasise the importance of it I will repeat it one more time. If you have half of your course of antibiotics and then realise that you are starting you feel better so decide to discard the rest, you are being oxygen fuelling this fire. Half a course will destroy the weak bacteria, but what about those that are a little more resistant? We don’t want to leave them to grow, multiply, divide and thrive. You must finish your full course of antibiotics, always. Always. But, it’s not just us as patients and members of the public that can do something to combat this apocalypse. I also think the government has a huge role to play. Pharmaceutical companies don’t make as much money out of antibiotic research and development. It’s more profitable for them to manifest time and money into statins used in CVD or immunotherapy drugs used in cancer treatments as these are long term issues which patients will repeatedly require treatment for. The government need to provide incentives to pharmaceutical companies to encourage more active research into newer, more effective antibiotics. What’s does the future look like? Despite how bleak the reality of this issue is, I do think there is some hope. Teixobactin is a newly discovered drug that has been found to treat many common bacterial infections such as tuberculosis, septicaemia and C. diff, and could be available within five years. But more importantly it could pave the way for a new generation of antibiotics because of the way it was discovered. Scientists have discovered a way of using an electronic chip to grow the microbes in the soil and then isolate their antibiotic chemical compounds. Testing on mice has already shown that the antibiotic works well at clearing infections, without side-effects. Scientists now concentrating on upscaling production so that it can be tested in humans. This could be an incredible ‘game-changer’, however, unless we are careful these new soil antibiotics could end up in the same state as the Pencillins. So what do you think, do you think we will have to face this new emerging army of resistance? Do you think we will be forced back to the time when patients used to consistently die on the surgical table due to incurable infections? Next articleLife StuffMY FIRST ATTEMPT AT KINETIC TYPOGRAPHY!